I found the most amazing cherry tomatoes this week at the market and I've been adding them to everything. I've tossed them in a Greek salad, diced them with some avocado and even eaten them raw. 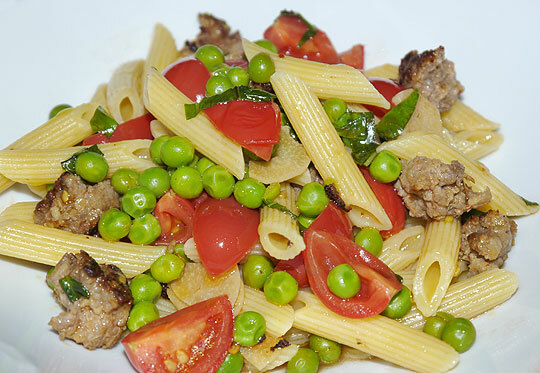 Pasta with sausage and peas is a frequent week night dinner at our house. This time I decided to add some quartered cherry tomatoes. Thrown in right at the end...so just warmed not cooked....they gave a new dimension to this already yummy dish. Heat olive oil in skillet over medium high heat. Remove sausage from casing and crumble. Add sausage to skillet and cook until brown. Add garlic, and crushed red pepper. Cook until slightly brown and fragrant. Meanwhile, cook pasta in a large saucepan of boiling salted water until al dente. Add peas and a small amount of pasta water to the sausage mixture and cook for about 3 minutes. Toss in tomatoes at last minute. When the pasta is cooked add to pan and mix. Top with a drizzle of olive oil and some fresh chopped basil.